Nowadays, more and more home owners, as well as designers pay attention on the interior design, modern or antique, and the combination of both. So, if you are in the process of indoor ornament, new trend of it would be worth to notice. People who learning design would know that there is a very important concept- one integrated mass for the whole and the part in the design course. How to make the decorative stone fuse into the whole, which is the key success factor if the design of decorative success or not? 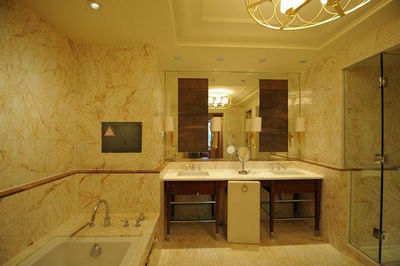 The gold spider application in Macau Wynn hotel let us once again proved this point. 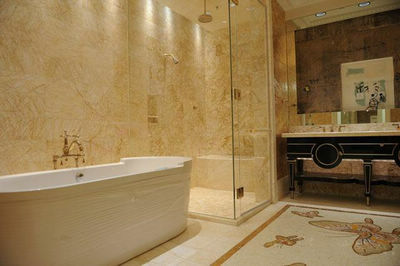 The characteristic of Gold spider marble is yellow gold thread woven with white bottom, which is in line with the overall color style; At the same time, it enhance each other's beauty with the ground Mosaic parquet.